Hope you enjoy my posts,please come back! Life is a Process ! Encouragement for today; Everyone of us goes through tough times,which might make you feel like you are on your own, or that you are suffering alone. Remember,our LORD JESUS, right before he was led to the final sacrifice of crucifixion, HE was totally abandoned,HIS disciples all slept while HE was agonizing, in desperate prayer in the garden of Gethsamane, alone. Even on the cross HE cried; 'My GOD, My GOD why have YOU forsaken ME?' (Not that our GOD-PAPA abandoned our LORD JESUS, but our GOD-PAPA could not stand looking on all the filthy sin of humankind which at that moment were all laid on JESUS at the cross) JESUS paid the price of solitude and abandonment on the cross, so that each of us can enjoy all the benefits of HIS company. 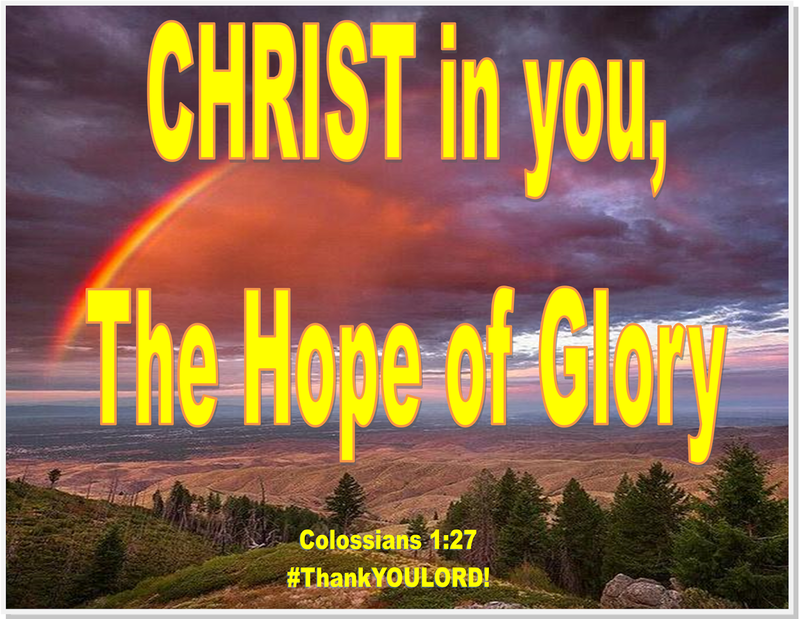 CHRIST in you, and me The Hope of Glory. This promise is also tied to our LORD's many many joyful promises like; 'I will never leave you nor forsake you' Deut. 31:6 or 'I will be with you til the end of time' Matt. 28:20. You might need an encouragement from our never-leaving GOD,HE loves you so much that JESUS gave HIS life to redeem us HIS lost children. HE will come IN to your heart if you accept JESUS into your heart as your personal LORD and Saviour, Rev. 3:20 our Lord JESUS says' I stand at the door (your heart) and knock, If anyone should hear My voice and open the door, then I will come in to him'. Isn't life better knowing that our GOD is not out there,nor beside nor behind you or elsewhere around you But,HE's actually INSIDE you and me? And so forever you will enjoy the company of The KING of Glory,our Deliverer,our Fortress, our Present Help in times of trouble, our Loving,Wonderful,Merciful and Gracious GOD.You are never alone.Praise The LORD! For HIS Mercy endures forever! in JESUS' Name Amen! 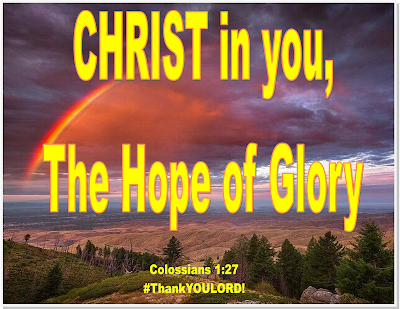 Thank YOU Very much GOD-PAPA for YOUR Powerful Love in the Blood of our LORD JESUS! AMen!